There’s NO OTHER book in sales like mine, GUARANTEED! And here’s why. 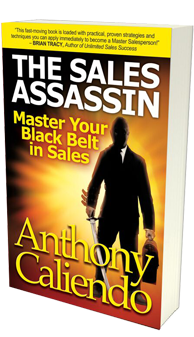 • Learn My Nine Belts to Become a Sales Assassin Master! • You’ll discover the Trinity of Sales Success – Passion, Dedication and Courage! • You will develop a New Mindset Geared towards Ultimate Sales Success! • You will learn redefined Sales Philosophies that have yet to be taught! • Corporations – You WILL learn how to create a disciplined and highly motivated sales force! So prepare yourself for a new path to positive thinking, self-discipline and to FINALLY controlling your sales destiny as a Sales Assassin Master! Visit me on the web at thesalesassassin.com and follow me on Facebook and Twitter for book launch dates, sales tips and more! 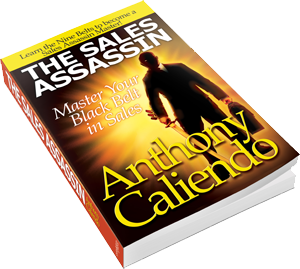 This is Anthony Caliendo, and I AM the Ultimate Sales Assassin Master! ← Do You Have 20 Seconds of Insane Courage?